Is your best friend getting married? It is a big day for her and you because these are the little moments when you realize that you have grown up. While you two have stuck together through thick and thin, taking every tough decision and trying to win every challenge in your stride, another very sweet yet significant decision that you will have to take for this big day is choosing the outfit that you are going to be wearing on the wedding day. Usually, it is the bride that takes this decision. But if the bride has also shared this responsibility with all of you girlies like old times, then you will too, have to participate with equal enthusiasm. Sometimes the bride can just guide you with a particular color and ask you to decide on the style while sometimes she might just provide you a particular neckline or sleeve style and you are asked to pick the color. So, if your best friend has chosen a glamorous and retro red carpet like or Hollywood night theme and wants her girlies to deck up in shimmer and shine, then you have to pick dresses which have a lot of sparkles and sequins in their design. Well, this can especially be a problem if you are not a bling fan yourself. Are you wondering how will you choose the right dress for yourself in such a scenario? Well, you must look at the simple sequin bridesmaid dresses which can be worn for private parties or Friday night clubbing. Here, we have handpicked a few designs just for you which can be used even after the wedding. Take a look. If you don’t like a complete shimmery look, then you can divide your dress into two parts. Let the torso or the upper half of the dress be shimmery while the lower half be in chiffon or any other fabric that you like. Choose the dress in an A-line style so that it is cinched at the waist and the lower half is flowing. The shimmery detailing with the sequins on the torso region adds a beautiful dimension to the dress and yet it is not overwhelming because it is a certain portion of the dress. Keep it sleeveless and have a deep, plunging v-neckline for some oomph factor. This is a great sequin dress that you can wear for the wedding. It is comfortable and stylish just like you want it and also shimmery enough for the bride. For some of you who are quite fashion conscious, it will be a known fact that shimmer and shine are retro and very much have a vibe of the 80s. And yet some people love it. But if you are not so fond of it, then you can combine it with something trending. In the world of fashion, there are constant evolutions and reworking of the established traditions. So, even the sparkling sequins have made a great comeback this wedding season. If you don’t like to don the whole shimmery gown full of sparkling sequins, then just go for a two-piece bridesmaid dress, where either the top or the lower half can be in shimmer. This adds a bling to your look but it does not cover you head to toe in it, giving you the space to breathe. A common reason why girls often fret about shimmery themes at weddings is not that they cannot find a sequined outfit but because they might waste the money because they cannot wear it elsewhere. But that is not true. If you pick the right dress, then you will be able to wear it to the nightclubs on Fridays. Go for a small number in off-shoulder, sweetheart neckline and A-line style which goes with every kind of body type. Perfectly glamorous and sensuous for the clubs and yet meeting the bride’s demand for sequins, this is the look that you want for your wedding. 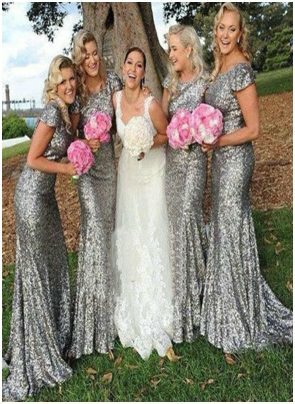 So, don’t think twice and start hunting for the silver, ivory, rose-gold, or gold sequin bridesmaid dresses today.